The live-action Mulan has officially been named! The 30-year-old Chinese actress will lead the film as the Hua Mulan. A legendary female warrior who is believed to have taken her father’s place in the army. Disney’s modern rendition of the beloved animated movie remains quietly underway. 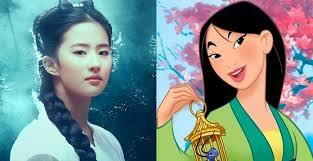 Although, the studios finally announced the project’s main star on Wednesday: Liu Yifei. 1. She’s been acting for more than a decade. With her earliest acting credit from 2002, the star has quite the resumé under her belt. While this Disney role may elevate her to a new level of fame in America, she’s already a well-reknowned actress abroad. Of course, there can’t be Mulan without some “Reflection.” Fortunately, Yifei already has some pipes for if and when it comes time to sing. The actress was reportedly signed to Sony in Japan. 3. She’s a glamour girl. 4. She’s acted alongside some major Hollywood stars. Yifei is no stranger to acting in English, having starred alongside Jackie Chan in 2008’s The Forbidden Kingdom and Nicolas Cagein 2014’s Outcast. In addition to being a multi-talent, Yifei won the Golden Lotus Award for Best Actress at the Macau International Movie Festival in 2013.
nice picture, is that wulan?